This article is about the market town in Hampshire, England. For the district called Romsey Town in the city of Cambridge, England, see Mill Road, Cambridge. For the town in Australia, see Romsey, Victoria. Romsey (/ˈrɒmzi/ ROM-zee) is a market town in the county of Hampshire, England. Romsey was home to the 19th-century British prime minister Lord Palmerston, whose statue has stood in the town centre since 1857. The town was also the home of the 17th-century philosopher and economist William Petty and the 20th-century soldier and statesman Louis Mountbatten, 1st Earl Mountbatten of Burma. Notable buildings are the Corn Exchange, built in 1864, and the town hall, which was built in 1866. The town's woollen industry survived until the middle of the 18th century, but was beaten by competition from the north of England. However, new fast-growing enterprises soon filled the gap with brewing, papermaking and sackmaking, all reliant upon water from the Test. During the 19th and early 20th centuries Romsey became notable for making collapsible boats, invented by the Rev. Edward Lyon Berthon in 1851. The Berthon Boatyard in Romsey made the boats from 1870 until 1917. They were used as lifeboats on ocean-going liners. By 1794 a canal connected Romsey to Redbridge – at the mouth of the River Test – and Andover to the north but within 50 years had largely fallen into disuse. Industry continued to grow. Romsey was a reasonably large town for the early 19th century: its population was 4,274 in the first census of 1801, compared with just 8,000 for Southampton. Despite the arrival of the railway in 1847 the expansion slowed and whilst its population had grown to 5,654 in 1851 it then stagnated and by the time of the census half a century later (1901) the population was just 5,597. 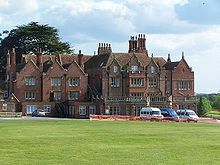 Lord Palmerston, the 19th-century British prime minister, lived at Broadlands, a large country estate on the outskirts of the town. His statue, by sculptor Matthew Noble, stands in the Market Place outside the Town Hall. Broadlands later became the home of Louis Mountbatten, 1st Earl Mountbatten of Burma, known locally as "Lord Louis". In 1947, Mountbatten was given his earldom and the lesser title "Baron Romsey, of Romsey in the County of Southampton". Queen Elizabeth II's husband, Prince Philip, was his nephew and upon Philip's marriage to Elizabeth in 1947 they departed London for their honeymoon at Broadlands. Mountbatten was buried in Romsey Abbey after being killed in an IRA bomb explosion in Ireland on 27 August 1979. After his death his titles passed to his elder daughter, Lady Brabourne, who thus became Countess Mountbatten of Burma. Her eldest son was styled by the courtesy title "Lord Romsey" until he inherited the title of Lord Brabourne in 2005, and then the earldom in 2017. Like his parents, Charles, Prince of Wales and his first wife Diana, Princess of Wales spent the first part of their honeymoon at Broadlands in 1981. Embley Park, a country estate located on the outskirts of Romsey was the home of Florence Nightingale, known for her pioneering work as a nurse and sanitary reform during the Crimean war and for laying the foundation of modern nursing. Nightingale is said to have had her calling from God whilst sitting under a giant cedar tree in the grounds of Embley Park on 7 February 1837. The site is now home to a private school. Nightingale is buried in the family vault at St. Margaret Church in East Wellow, located on the outskirts of Romsey. Three industrial and trading estates focus mainly on service industries and small-scale manufacturing. Three scientific and high technology employers – Roke manor research, Southampton Science Park and IBM – have establishments nearby. The town centre has a Waitrose supermarket, an independent department store (Bradbeers), and other retail outlets, including high street chains and independent shops. Romsey is part of the Romsey and Southampton North parliamentary constituency. Its current MP is Caroline Nokes of the Conservative Party. Elected in the general election on 6 May 2010, after boundary changes, she defeated the Liberal Democrat MP Sandra Gidley with a 4.5% swing to Conservative from Liberal Democrat and a majority of 4,156 votes. Gidley had held the seat since a by-election in 2000 in the former Romsey seat. The town is part of the Test Valley district council which is controlled by the Conservative Party. Norton Knatchbull, 3rd Earl Mountbatten of Burma, grandson of Louis Mountbatten, 1st Earl Mountbatten of Burma, is the current High Steward, a position which dates from the 16th century (see above). Romsey Abbey is a Norman abbey, originally built during the 10th century, as part of a Benedictine foundation, housing a community of Benedictine nuns. The surviving Anglican Parish church of Romsey, now the largest parish church in the county, is the town's most outstanding feature and is open daily to visitors. King John's House & Tudor Cottage was allegedly a hunting lodge used by King John of England whilst hunting in the New Forest. However, the existing building dates from much later. It does contain a number of extremely unusual and exciting historical features, including medieval wall decorations and graffiti, as well as a floor made of animal bones. The house is reportedly[by whom?] haunted by at least four ghosts, including a black shrouded figure, encountered by the Hampshire Ghost Society during their investigations between 2002 and 2008. The house is a Grade I listed building. The Plaza, in Winchester Road, is a fully equipped 230-seat art deco style theatre, originally built as a cinema in the 1930s, it became a bingo hall until the 1980s. It was converted in 1984 and is now home to local amateur dramatics group, Romsey Amateur Operatic and Dramatic Society (RAODS), who stage between ten and fourteen productions each year and hire the venue out for other local productions, concerts, and functions. The existence of Sadler's Mill, the only mill to be developed on the main course of the River Test, is first recorded in the 16th century, when it functioned as a corn and grist mill. Milling ceased in 1932 and the building was left derelict for many years until it was restored by new owners in 2005. The Swan Inn, a former public house now home to the Conservative Club, is said to be haunted by two Roundhead soldiers, who, according to local legend, were hanged from the iron sign bracket. One of the pair managed to cut himself loose and run into a nearby alleyway, where he soon died. The White Horse Hotel is a Grade II* listed 18th century coaching inn which now houses a 4-star hotel and brasserie owned and operated by Silks Hotels. The assembly rooms are where Lord Palmerston is said to have first engaged in public political debate. The Mummers Gallery and Georgian Staircase are reportedly haunted by the ghost of a lady in white. The town's memorial park which plays host to the annual Mayor's picnic, contains a Japanese World War II artillery gun, one of a pair captured by the British and brought back to Romsey by Lord Mountbatten of Burma. One was donated to the town by Lord Mountbatten, and the other was retained in the grounds of his country estate, Broadlands. Built in 1865, the signal box controlled the freight and passenger trains running on the railway lines passing through Romsey until 1982. Rescued from demolition by Romsey and District Buildings Preservation Trust, it is now a working museum. The Romsey Agricultural & Horse Show is a large agricultural show that takes place on the second Saturday of September every year at Broadlands. The show is one of the oldest in England, held annually since 1842. In addition, Broadlands has twice hosted the CLA Game Fair, the largest countryside show in the world, most recently in July 2006. The Romsey Arts Festival occurs every 3 years, showcasing talent from in and around the local area. Romsey Classic Car Show is a charity event that has been running on Boxing Day since 2002, attracting hundreds of pre-1976 vehicles to the town centre car parks. Romsey has two Rotary Clubs which are active, working with local business partners and schools to raise charitable funds for the community. The Rotary Clubs organise the annual Walk The Test Way which has become popular with several hundred walkers raising money for charities. Robert Brydges – Quiz-show contestant who became the third winner of the TV game show Who Wants to Be a Millionaire? 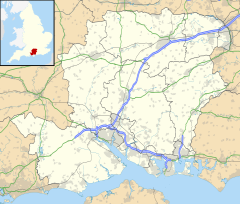 Romsey is within 10 miles (16 km) of both the M27 and M3 motorways, providing fast links along the south coast and to London, and to the Midlands and the North via the A34. The A36 runs a few miles west of the town, providing a direct but not particularly quick route to the West of England and South Wales. There are cycle links to Southampton and Salisbury via route 24 of the National Cycle Network. Romsey has a railway station with frequent services (operated by Great Western Railway) running on the route between Portsmouth and Cardiff, via Southampton, Salisbury and Bristol. In 2004, an hourly South West Trains local service was introduced, running to Chandler's Ford and Eastleigh and then down to Southampton and Totton. The noise from these new services attracted complaints from local residents, who demanded their withdrawal, and there were also suggestions that some of the journeys regularly carried no passengers. However, its future is assured under the new South West Trains franchise, which saw the service altered from December 2007 to run from Romsey to Southampton via Eastleigh as currently, then back to Romsey via Millbrook and Redbridge and on to Salisbury. The result is more train services for Romsey than at any other time in its history, with particular improvements for passengers travelling to Southampton or Salisbury. A dedicated shuttle bus linking Romsey with fast London trains at Winchester was discontinued in 2009 despite a campaign to save the service. Other bus services are provided by Wilts & Dorset within the town and to Salisbury, Bluestar to Southampton and Eastleigh and Stagecoach within the town and to Winchester. The Wessex League football club Romsey Town FC play at The Bypass Ground, South Front. Romsey Rugby Football Club is based at Romsey Sports Centre. It fields teams of all ages each weekend of the playing season. The town has a swimming pool, the Romsey Rapids. Published every Friday, The Romsey Advertiser is the town's newspaper printed at Redbridge, Southampton. In the 1980 and 1990s, Romsey was used as the location of fictional Sussex town 'Kingsmarkham' in the television series The Ruth Rendell Mysteries. Romsey locations appear throughout the series concerning Inspector Wexford played by George Baker. The location used for the fictional police station was the former Romsey Magistrates Court in Church Street. A fictional "Underground car park in Romsey" is referred to in an episode of the hit-TV series Absolutely Fabulous. ^ "Town Population 2011". Neighbourhood Statistics. Office for National Statistics. Retrieved 7 January 2017. ^ "Test Valley demographic data" (PDF). testvalley.gov.uk. 1 July 2017. Retrieved 17 March 2019. ^ "Town Centre Improvements". www.hants.gov.uk. Retrieved 17 March 2019. ^ a b c "Romsey Abbey: Saxon History and Archaeology". www.britannia.com. Retrieved 2017-04-02. ^ Liveing, Henry George Downing (1906). Records of Romsey Abbey: An Account of the Benedictine House of Nuns with Notes on the Parish Church and Town (A.D. 907-1558) : Compiled from Manuscript and Printed Records. Warren and Son. pp. 26–27. ^ "Florence Nightingale: Her Funeral". Countryjoe.com. 20 August 1920. Retrieved 10 January 2014. ^ a b c Scanlan, David (2009). Paranormal Hampshire. Amberley Publishing. ISBN 978-1848682573. ^ Historic England. "KING JOHN'S HOUSE (1231745)". National Heritage List for England. Retrieved 10 September 2018. ^ "Paza Theatre". Plaza Theatre. Retrieved 10 September 2018. ^ "Romsey Signal Box". Friends of Romsey Signal Box. ^ Charles Butler. "Romsey". Charlesbutler.co.uk. Archived from the original on 21 November 2008. Retrieved 10 January 2014. ^ "Charlie Dimmock profile: news, photos, style, videos and more". Hellomagazine.com. Retrieved 10 January 2014. ^ "Test Valley Borough Council". Testvalley.gov.uk. Archived from the original on 10 January 2014. Retrieved 10 January 2014. ^ Angelini, Sergio. "Ruth Rendell Mysteries, The (1987-2000)". Screenonline. British Film Institute. Retrieved 7 November 2018. Wikimedia Commons has media related to Romsey.